On Sunday, Craig and I finished our eighth and final hike to complete the Hiking Spree for this year. As it was a cold, cloudy day, we chose an easy 1.7 mile hike at Thumb Butte. Driving there, I felt a little bit of de ja vu, recalling the last time we had hiked that trail. It was the first year of the Hiking Spree, and time was running out. We needed to complete two hikes in one day. The choices of hikes included two at Thumb Butte, so we decided to kill two birds with one stone so to speak. It was a cold, cloudy day, much like last Sunday but we were undaunted by the weather. Reaching Thumb Butte, we decided take the hike to the top first in case the weather went bad. The rain began just as we started up the trail. As we continued, we encountered hikers running down the trail, but we were the only ones still going up. That should have been a clue, but we pressed on. Soon the rain changed to snow. Thunder and lightning was all around us as we struggled to reach the top of the mountain, hoping we would be sheltered on the trail back down. Wind was whirling the snow around as we reached the top. The steep switchbacks that lead back down the mountain are paved and a rail is provided for safety. Since we didn’t have gloves and there was lightning all around, we were afraid to touch the metal rail. As is typical of Arizona, the storm ended just as we finished our hike. Cold and wet, we sat in our car and warmed up. Then we hiked the second trail as the sun began to peek through the clouds. Fortunately for us, the weather held out on Sunday and we enjoyed a lovely hike with beautiful views of Thumb Butte. This year’s Hiking Spree included many trails along the Prescott Circle Trail–50 miles of trails that go all the way around Prescott. One of those is the Longview trail, beginning on Williamson Valley Road, just past the light at Pioneer Parkway. Along the hike, we were treated to views of Glassford Hill, Granite Dells, and Mingus Mountain. I was surprised to discover a wonderful trail tucked neatly into the middle of Prescott at Aker Park. To get there, you simply drive south on Virginia Street until it ends. We took the longest trail–only 1.6 miles long–and took our daughter, Kirstin, along for the fun. We even had time left over to explore the Odd Fellows Cemetery in the southwest corner of the park. I was unable to find the famous Prescottonians buried there,(James Aker, James Cleator, and Barlow-Massick) but not from lack of looking. Kirstin was anxious to get home to do her laundry and so I was forced to give up my search. We did enjoy some of the longer, 4-7 mile hikes. John’s Tank is a hike near Lynx Lake–trail 94 just east of the dam. I had seen that trail before and wanted to try it, but it was closed at the time because eagles were nesting there. It was a nice hike with views of the lake, creeks and lots of ups and downs. 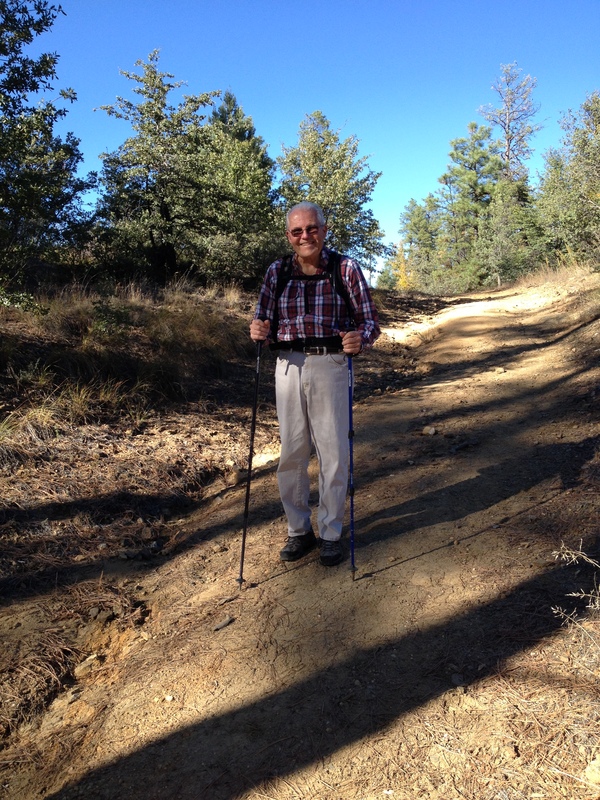 Goldwater Lake West is a hike that goes around the While Spar Campground and finishes on the old Schoolhouse Gulch Road. 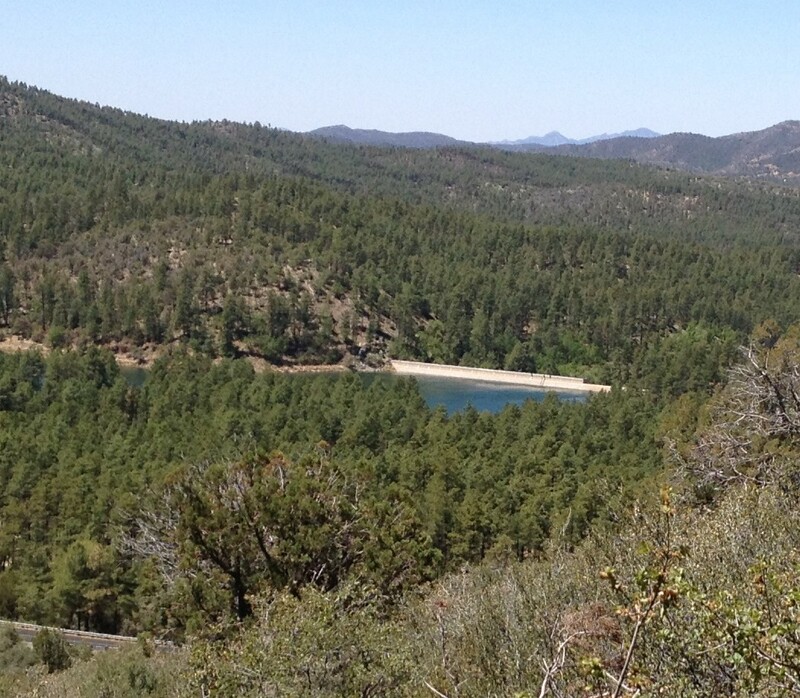 Though it doesn’t go near Goldwater Lake, it is still a marvelous hike through the pines. We only lost our way once this year, which is probably a record. When we hiked the Southwest portion of the Ranch Trail (The Rancho Vista Trail in book three is based on the Ranch Trail. ), we decided to take the longer route that was a loop back to our car on Senator Highway. Unfortunately, we made a wrong turn when we were circling back. The trail we took south was a very steep, rocky old jeep road. It seemed like we were going the right way until we reached the bottom of the trail which suddenly turned east toward Walker Road. Fortunately, we ran into a very kind fellow hiker we had encountered previously. She suggested that we continue to Walker Road and then she drove us back to our car on Senator Highway–saving us about four miles of additional hiking. 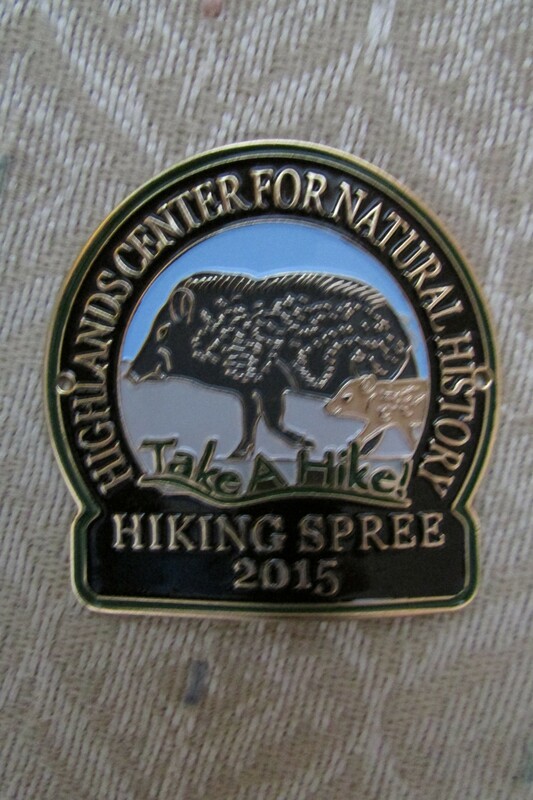 If you live in or near Prescott, I highly recommend the Hiking Spree, a program of the Highlands Center for Natural History. It is a good way to get in the habit of hiking regularly. If you are planning to come to Prescott to do some hiking, I suggest you check out the Highlands Center website. (highlandscenter.org) Not only will you find maps for this year’s Hiking Spree, but also maps from previous years. These are very detailed maps with driving directions and points of interest to look for on your hike.